Boon knew I was sick and wanted to bring me for some tonic nutrition but they were washing up the stalls (they occupy two!) when we arrived 20 minutes before their closing hours. I guess business was so good that day, they’d sold out! 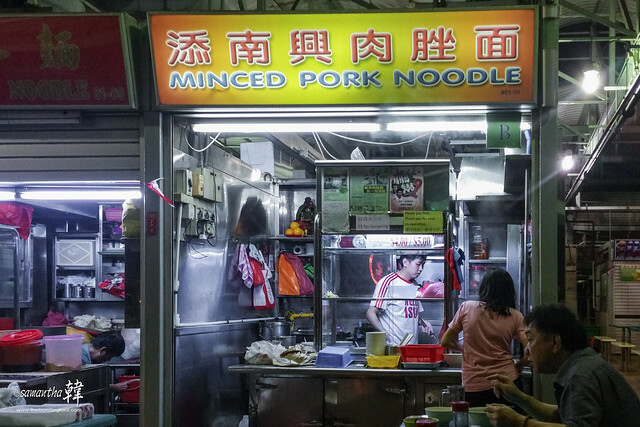 We walked around Kaki Bukit 511 Market and Food Centre and Boon remembered a friend, who lives in Bedok, saying that the minced pork noodle here was just as good if not better than the famous minced pork noodle soup (Xing Ji Rou Cuo Mian) at Fengshan Market & Food Centre (Blk 85 Bedok). Since most of the stalls were closed for business that night, it was around midnight, we decided to try it as there wasn’t much choice anyway. 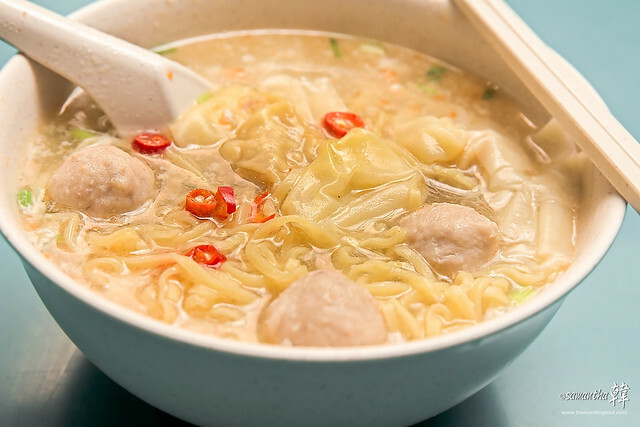 Minced Pork Noodle – S$4 (with dumplings). We had the S$4 portions as it came with dumplings. The S$3 portion do not. About a week later, Steven, my macro kaki, met up with Boon and I when we went back to Kaki Bukit Food Centre (FC) for our tonic meal. We discussed about what’s nice to eat in this FC and mentioned Tian Nan Xing Minced Pork Noodle. He felt that S$4 is overpriced for this noodle soup in a heartlander’s estate. While Boon agrees, he also said he’d rather pay a little more since there’s no long wait comparing to Xing Ji Rou Cuo Mian. I did not know the price difference until I got home and dug my old photos. Only then do I realised that Xing Ji’s price starts at S$2.50 with more pork balls and Tian Nan Xing’s starts at S$3. Fifty cents is a lot of difference for the average income earners in Singapore especially when the two food centres are so nearby. Address: Kaki Bukit 511 Market and Food Centre. #01-10, 511 Bedok North Street 3. Click here to see Xing Ji Rou Cuo Mian 兴记肉脞面 post. And click here to see Bedok 85 Xing Ji Rou Cuo Mian 兴记肉脞面 post. Love, hugs and looking for some more fine dining.